One big problem a lot of people have is that they slip into thinking of themselves as victims that have little or no control over their lives. In this headspace you feel sorry for yourself, the world seems to be against you and you get stuck. Little to no action is taken and you get lost in a funk of sadness and self-pity. So how can you move out of that mindset? In this article I’d like to share a few things that have helped me. 1. Know the benefits of a victim mentality. Attention and validation. You can always get good feelings from other people as they are concerned about you and try to help you out. On the other hand, it may not last for that long as people get tired of it. You don’t have to take risks. When you feel like a victim you tend to not take action and then you don’t have to risk for example rejection or failure. Don’t have to take the sometimes heavy responsibility. Taking responsibility for you own life can be hard work, you have to make difficult decisions and it is just heavy sometimes. In the short term it can feel like the easier choice to not take personal responsibility. It makes you feel right. When you feel like the victim and like everyone else – or just someone else – is wrong and you are right then that can lead to pleasurable feelings. In my experience, by just being aware of the benefits I can derive from victim thinking it becomes easier to say no to that and to choose to take a different path. It also makes it easier to make rational decisions about what to do. Yes, I know that I can avoid risk and the hard work of taking action by feeling like a victim. But I also know that there are even more positive results if I choose to take the other route, if I make the better choice to take a chance and start moving forward. 2. Be ok with not being the victim. So to break out of that mentality you have to give up the benefits above. You might also experience a sort of emptiness within when you let go of victim thinking. You may have spent hours each week with thinking and talking about how wrong things have gone for you in life. Or how people have wronged you and how you could get some revenge or triumph over them. Now you have to fill your life with new thinking that may feel uncomfortable because it is not so intimately familiar as the victim thinking your have been engaging in for years. Why do people often have self-esteem problems? I’d say that one of the big reasons is that they don’t take responsibility for their lives. Instead someone else is blamed for the bad things that happen and a victim mentality is created and empowered. This damages many vital parts in your life. Stuff like relationships, ambitions and achievements. That hurt will not stop until you wise up and take responsibility for your life. There is really no way around it. And the difference is really remarkable. Just try it out. You feel so much better about yourself even if you only take personal responsibility for your own life for a day. This is also a way to stop relying on external validation like praise from other people to feel good about yourself. Instead you start building a stability within and a sort of inner spring that fuels your life with positive emotions no matter what other people say or do around you. This question changes my perspective from a narrow, self-centred one into a much wider one. It helps me to lighten up about my situation. That is very helpful to keep your focus on how to solve a problem or get something good out a current situation. Rather than asking yourself “why?” over and over and thereby focusing on making yourself feel worse and worse. It’s easy to get wrapped up in thinking that forgiveness is just about something you “should do”. But forgiving can in a practical way be extremely beneficial for you. As long as you don’t forgive someone you are linked to that person. Your thoughts will return to the person who wronged you and what s/he did over and over again. The emotional link between the two of you is so strong and inflicts much suffering in you and – as a result of your inner turmoil – most often in other people around you too. When you forgive you do not only release the other person. You set yourself free too from all of that agony. 6. Turn your focus outward and help someone out. Asking that question and making that shift in what you focus on really helps, even if you may not feel totally like doing it. So I figure out how I can give someone else value, how I can help someone out. And thing is that the way you behave and think towards others seems to have a big, big effect on how you behave towards yourself and think about yourself. For example, judge people more and you tend to judge yourself more. Be more kind to other people and help them and you tend to be more kind and helpful to yourself. A bit counter intuitive perhaps, but that has been my experience. The more you love other people, the more your love yourself. 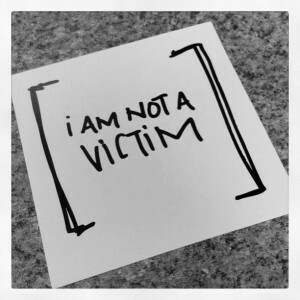 Getting out of a victim mentality can be hard. Some days you will slip. That’s ok. Be ok with that. And be nice to yourself. If you have to be perfect then one little slip is made into a big problem and may cause you to spiral down into a very negative place for many days. It is more helpful to just give yourself a break and use the tips above to move yourself into a positive and empowered headspace once again.